what a wonderfully relaxing yawn. Happy WW. That tummy begs to be tickled. purrr....meow! I would have had to scratch the tummy! No two ways about it! Target! You really know how do do stretching well! That is quite a yawn and stretch - and a great capture, right place at the right time! That is an AMAZING shot!! wonderful stretch. love the capture. btw, i enjoy reading your articles on the Star. keep up the good work. What nice sharp teeth and claws you have, Target! I love your spotty belly, too. P/S: I've never met a cat who is not relaxed. I love those teeth and claws, Target. They look like mine, MOL. My mom wants to get into your tummy and give it lots of kisses. She's always annoying me like that. It would be good for her to have another kitty tummy to adore. 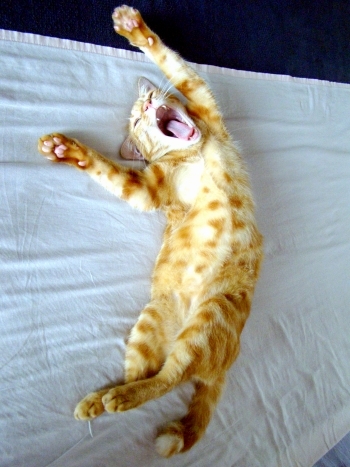 A satisfying stretch and yawn! Love the photo. Great capture. aren't cat interesting? Just waking up I suppose. What a brilliant picture - we wondered if it was a wake-up yawn and Target had a glint in his eyes! OMG that's the cutest thing ever! Nothing like a baby yawn! Now that's the way to stretch! Wow TARGET, you are gorgeous, hmmm what a pose, I think you are very relaxed there and it is also very inspiring, I will go for another nap here zzzzzzzzzzz! ::Thunk:: That sound was mom falling down from the cute! Target is just so adorable - that belly - oh so so cute!! nice shot.. catching a picture of your cat as such..